Cruise through the gorgeous waters surrounding Melbourne and take in the sights as you celebrate on board the most unique party boat in the country. 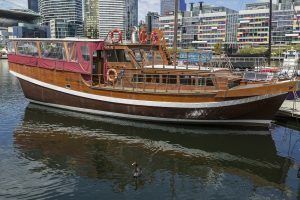 The stunning Oriental Queen charter boat is classy, stylish and big enough to accommodate up to 60 guests comfortably, making it Melbourne’s party boat of choice for any type of event. And with our incredible packages and full service options, it’s easy and convenient to plan your whole event on board our gorgeous vessel. You and your guests will relax in style thanks to the teak finishes and luxurious fabrics of our recently renovated Chinese Junk. You can enjoy cold drinks and delicious food with any of our catering options as our party boat cruise takes you from Docklands around the lower Yarra River to the city before heading out to Port Phillip Bay. You and your guests will see the city from a new perspective with Melbourne’s skyline as your backdrop. Whether you take in the sights by day or watch the sun set over the city, we’ve simply got the best views of any venue in the city. Looking for party boat hire for just a few hours? Or are you ready to dance and drink all through the night? Whatever you’re after, we can design the perfect party boat package to suit your needs. Our team can even help you create custom furniture configurations and decorate the boat to suit your theme. 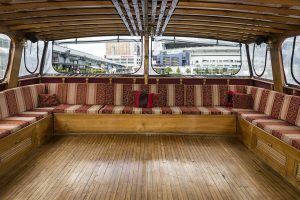 From a large dance floor space to the perfect spot to sit and watch this season’s biggest match, the Oriental Queen is spacious and comfortable for groups large and small. No crowds, no queues and no cover charges! Perfect for weddings, birthdays, anniversaries, sightseeing or entertaining your most important clients, there’s a great excuse for a party boat cruise any time of year. Our clients have come up with every possible reason to celebrate on board a charter boat cruise, and we work closely with you to ensure your vision is brought to life. So we encourage you to get creative! 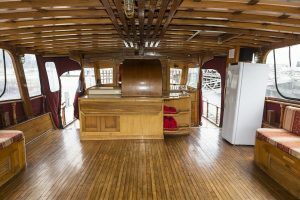 With full catering available, a kitchen on board and a fully licensed bar, there are options for sophisticated cocktail parties or full lunch or dinner menus. We can even have Yum Cha and Nyotaimori cruises if you want to keep with the Oriental theme of our stunning vessel! In addition to our comprehensive food and drink packages, we also offer convenient optional extras such as transfers, custom music and décor. Our team go the extra mile to ensure your charter boat hire is simple and comprehensive so you can enjoy your event and spend time with your guests. Whether it’s a big group that wants to dance, a small networking group that wants to connect with intimate breakout spots, or even a romantic private party boat hire for two, our expert event planners take care of all the details from start to finish. With the luxury and class this charter boat provides, the Oriental Queen truly is a great venue for any type of celebration. So get creative and let our team help you create an incredible day on the water with this unique option for private boat hire in Melbourne. Not sure where to start? Let our team guide you through the process for seamless and stress free event planning that ticks all the boxes. 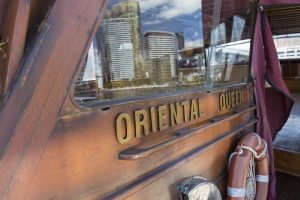 Discover Melbourne’s unique way to celebrate and jump on board the Oriental Queen for a party boat cruise that takes in all the best city views. From Docklands out to Port Phillip Bay, your party boat hire delivers a unique experience that no other venue can match. And with all the extras on offer, it is the most versatile and convenient venue in the area. The Oriental Queen is also available for holidays such as Christmas, New Year’s Eve or Australia Day, but booking in advance is highly recommended during these popular periods. Give our friendly team a call today to discuss all of our package options and to hire your party boat for a memorable night your guests will love.